It’s hard to look honestly at our past. Especially when some of our actions fall so short of our ideals. And when we do take a good hard look, Memory finds she’s not permitted to publish her report until it’s first been redacted by a team of lawyers and then forwarded on to the suits at PR for a slick revision. I’m not making this observation theoretically; I experience it personally, time and time again. My own ego keeps thousands of employees busy night and day crafting narratives that preserve its sense of self-respect. This is human nature, isn’t it? Portraying only the most flattering versions of ourselves? My own trouble confronting the truth, the whole truth, and nothing but the truth about myself inclines me to be understanding when others flounder in the same attempt. So it’s without condemnation that I observe this all too human tendency on full display in the series of essays being added to the LDS Church’s official website. Taken as a whole, the essays suggest a growing willingness by Church leaders to acknowledge decidedly unflattering moments from our history. This may be a watershed moment in an organization for whom transparency has been a one-way mirror where they could see us but we couldn’t see them. As one who takes seriously the call to be a peacemaker in this world, I find myself encouraged by the arrival of the newest essay, “Peace and Violence among 19th-Century Latter-day Saints.” But also disappointed. For me, this essay falls short in the same way the others fell short: it seems more intent on deflection than reflection. Hearing some commotion, my wife and I discover that one of our children has struck a sibling. Called to explain, the child recites a litany of abuses to which they’d been subjected. Once they’re certain that I fully appreciate the extent to which they themselves are the real victim, they will mention their own misdeed, but in terms that make their actions seem justifiable—or at least understandable—given the circumstances. In “Peace and Violence,” the Church seems to be following this pattern. The anonymous author(s) appear to have been given the task of explaining egregious acts of violence, such as the Mountain Meadows Massacre, in a way that reinforces our persecution narrative while also acknowledging a few isolated incidents in which Mormons were the aggressor. Throughout, allegations of violence perpetrated by members of the LDS church are either dismissed as being unfounded or over-blown, or, in the case of the well-documented Mountain Meadows incident, characterized as a tragic instance of the early Saints reacting poorly to the religiously-motivated hostility and sustained aggression they’d so long endured. I don’t object to context, mind you. Indeed, as the essay takes pains to establish, a pervasive culture of violence typified 19th Century frontier life (as any even-handed treatment of the subject would recognize). But this essay’s portrayal of early Mormons as peace-loving, turn-the-other-cheek folk who only occasionally lost their cool falls short of being fully candid. More importantly, it misses the opportunity to identify elements in our own church culture that kindled a spirit of vengeance and retaliation in our past, and which, I will argue in a future essay, continue to plague our present. The audience for this and the other topical essays is most likely the member or investigator who has encountered deeply disturbing facts of history and returns to the official Church website seeking the most comforting explanation possible. But what if we want our past to be a catalyst for transformation? Comforting explanations only reinforce our sense that “all is well and was ever thus.” Such an approach lulls us into spiritual complacency and retards our growth, both personally and collectively. Sometimes we should squirm. If we are honest, and if we are willing to squirm, we can use our history as a catalyst for transformation. I’ll share two ways the essay fails to be transformative. Episodes of violence often begin when one people classify another as “the other,” stripping them of any humanity and mentally transforming them into enemies. Once this process of devaluing and demonizing occurs, stereotypes take over, rumors circulate, and pressure builds to conform to group action against the perceived threat. Those classified as the enemy are often seen as the transgressors, even as steps are being taken against them. When these tinderbox conditions exist, a single incident, small or ordinary in usual circumstances, may spark great violence ending in atrocity. The literature suggests other elements are often present when “good people” do terrible things. Usually there is an atmosphere of authority and obedience, which allows errant leaders to trump the moral instincts of their followers. The second way the essay could have been transformative is by telling the truth in a way that lays bare our greatest vulnerabilities. No spin. Serve it up plain, without any dipping sauce. And when it comes to recounting our crimes against others, it seems to me we are under a special moral obligation to be completely and unreservedly honest. 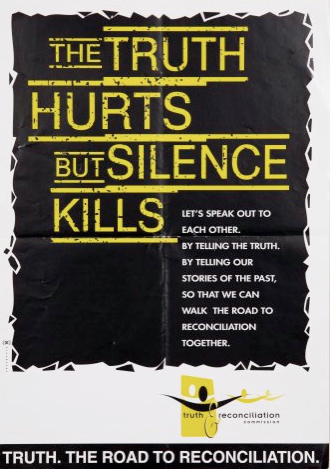 Official poster of the Truth and Reconciliation Commission in South Africa. By trying to preserve our own sense of our goodness, we fail to achieve a remission of our sins. Archbishop Desmond Tutu and Nelson Mandela taught the world this insight—that there is a redemptive quality found at the nexus of Truth and Reconciliation. From elbow to hands, they dripped with blood. Some tried to wipe it off on their shirts. Some searched for wounds that might be bleeding, but there were no wounds. Just bloody hands. Let’s tell the whole story. Leave nothing out. And when we tell it true, our hands will finally be clean. 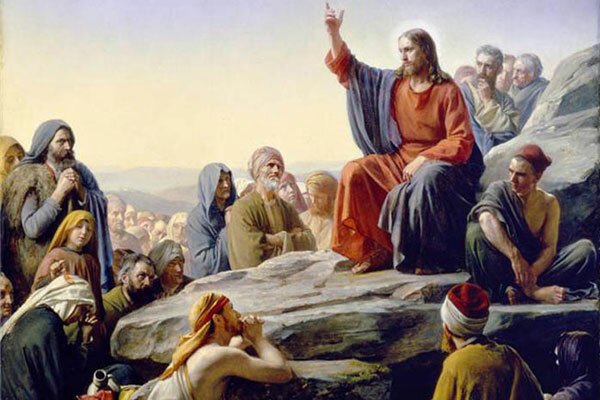 This entry was posted in Mormon Culture & Religion and tagged Archbishop Desmond Tutu, culture, culture of obedience, Elie Wiesel, humanity, intellectual honesty, mormon culture, Nelson Mandela, Orson Scott Card, peace, reconciliation, truth, vengeance, violence on May 23, 2014 by lonyoung1973.